Just this month scientists at Hawaii’s Gemini Observatory announced evidence of an undiscovered dwarf planet outside of Pluto’s orbit. This planet has a similar orbit to Sedna, another trans-Neptunian body. 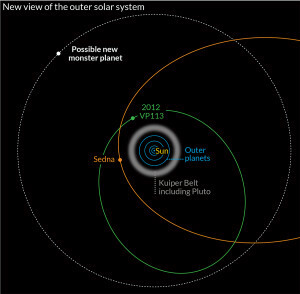 The new object, 2012 VP113, has a diameter under 280 miles. It gets as close as ~ 80 AU, and as far as 461 AU. This body may point to another planet, a supposed super-Earth. VP113’s orbit looks to be perturbed by a planet with a mass of about 10 Earth’s and about 250 AUs out. Previous searches for outer planets looked for gas giants, not terrestrial planets. The discovery of VP113 points to there being many more Sedna-like objects out there. This entry was posted in Science and tagged astronomy, dwarf planet by Chris Riley. Bookmark the permalink.